Buddhist lotus flower crafts for children focus on one of the most important symbols of Buddhism. According to Richard Beer's book, "The Handbook of Tibetan Buddhist Symbols," the lotus is the fourth of the eight auspicious symbols, which are symbols of good fortune used in offerings. 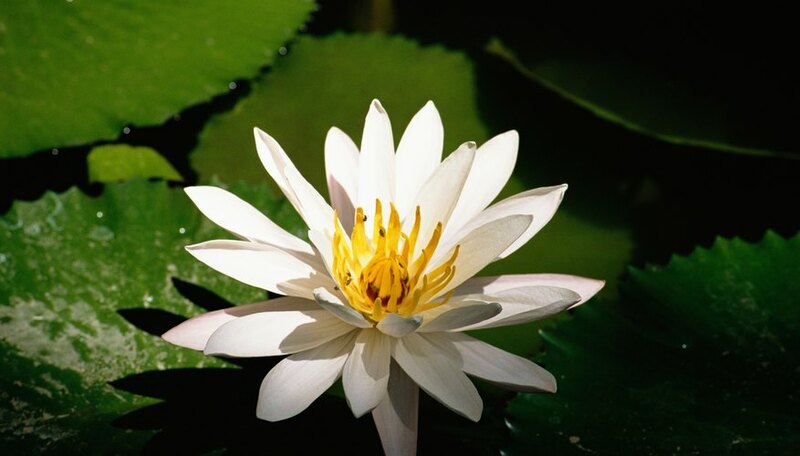 A lotus grows out of dark murky waters and is a symbol of purity and the divine. Offer Buddhist lotus crafts to children interested in the religion or who are already believers. Draw a nine-pointed symmetrical flower shape as a template for a watercolor paper lotus flower. Scan the template and print it out three different sizes, such as 100, 90 and 80 percent, for the craft. Trace each one onto the watercolor paper. Cut the flowers out and paint each one with watercolor paint. Add water to the largest flower with a brush. Roll the petals inwards slightly. Add water and roll the petals of the other flowers. Once these flowers dry, glue the middle-sized flower into the center of the larger flower. Then glue the smaller flower into the center of the other two flowers. Decorate with glitter. Create an origami lotus with a square piece of paper. Fold the square diagonally one way and then the other way. Open the paper up. Press each corner into the center to make a square. Fold each corner into the center again. Do this again for the third time. Flip the square over and fold each corner into the center. Fold each corner inwards about 1/4-inch. Pull each corner from starting from behind, inwards to the front to form a petal. Repeat with the three other corners. Pull out petals from between the first set of petals in the same fashion. Twist seven pipe cleaners to form a lotus flower. Form a figure "8" shape with one pipe cleaner. Repeat the figure "8" with five more pipe cleaners. Stack the pipe cleaners together so the petals are in a circular pinwheel shape. Wrap the last pipe cleaner around the others to secure. Pull up four petals to create the center of the flower and adjust the bottom petals to construct a realistic looking lotus flower. Craft a lotus lantern for Wesak, which is also called Vesak, on the full moon in May to celebrate the birth, enlightenment and death of the Buddha. Glue together two squares and eight equilateral triangles from craft sticks. Lay one square flat on the table. Squeeze glue into each corner of the square. Press the points of a craft stick triangle into each corner. Angle the triangles so the corners touch and the bottom forms a square. Glue the edges of the triangles to secure. Repeat with the other square and four triangles. Secure the two sections together with glue so the square craft sticks are the bottom and the top. Cover the lantern with paper and glue to secure. Light a tea candle and place the lantern over it.